" All of my pieces have a story to tell. They speak of the simple fullfillment of their own moments. They are 'Islands of Time' that have been set apart in a tangible way. These moments can be visited and revisited, learned from and enjoyed. Each piece is intended to remind the viewer of God's amazing love and the way He gives His blessings to these 'Islands of Time'. " . . . . S. L. Waldon When she is inspired, she becomes fascinated by inventing her own style and techniques. 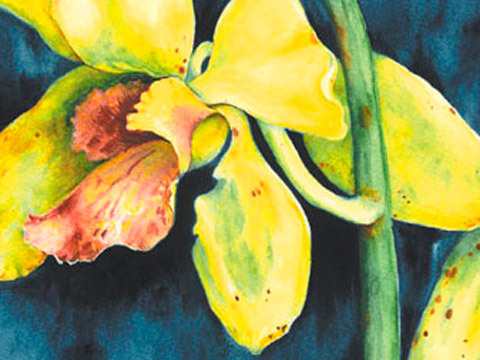 This versatile artist works in Watercolor, Pen & Ink, Pencil, Charcoal, Pastel, and Acrylic. She also offers Fine Art Giclee As a member of the Florida Keys Council of the Arts, and numerous other art organizations, Ms. Waldon has been awarded numerous Honorable Mentions, First and Second Place Ribbons, Awards of Excellence, and Best Of Show. Juries have described her work as "Museum Quality."